The Squamish Valley Music Festival is fast approaching. It’s one of the summer’s most popular events in BC. With an all start line-up featuring the likes of Eminem, Bruno Mars and The Roots to name just a few, we’re also seeing a commendable amount Canadiana throughout the festival. While some of the larger Canadian acts include Juno award winners Serena Ryder, Sam Roberts, and A Tribe Called Red, there’s a few lesser know acts that can ‘t be missed. 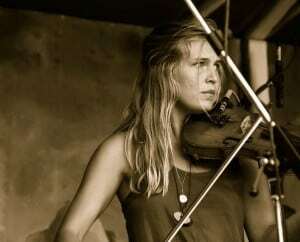 Enter the sweet sounds of violinist and loop artists, Hannah Epperson. Hannah is an amazing musician originally from Salt Lake City, Utah, but has made Vancouver her home since 2002. I doesn’t take much to see that she is incredibly intelligent, well spoken, witty, and one heck of a musician. Her style is described as orchestral folk but much like the her counterparts in the industry, Andrew Bird and Owen Pallett, her music can’t be put into one particular music style box. I had the great fortune of growing up with a slew of musical brothers (3 older ones, to be precise) and parents with musical priorities. I took up the violin in kindergarten because the cello was already taken (my brother Nicholas had already proved his mastery of the instrument) and my parents vetoed the flute (they were both concerned about the repertoire I would get stuck with as a flutist). From there, music somehow always managed to have social relevance in my life, in and between all the dizzying hormonal shifts and geographic relocations when I was growing up. I feel very lucky to have had the support to stick with it through all the turbulence. Do you have any advice for those trying to learn the violin? Violin is notoriously gnarly to learn. I think a poorly played violin can truly issue some of the most soul crushing frequencies known to man or woman, which can be a real turn off when you’re at the beginning of the learning curve. I think the most important thing to hold on to when you’re learning anything is your sense of humour. Making mistakes seems to get harder to bear as we get older. We get proud and impatient, we come to expect that mistakes and mishaps are things you grow out of. If you think about it, mistakes are what we grow out of… it is from our mistakes that we can ever hope to grow and evolve and take shape. That’s a great thing to remember when you commit to learning something new. Technically, I would pass along the advice to always keep a relaxed right hand. Perhaps the hardest aspect of playing violin is mastering the bow! In my opinion, the best performances come from an expressive, dancing right hand. What drew you to looping? I stumbled into the looping world quite by accident. My parents gifted my brother a looping pedal, which he never ended up using, so I tried it out in the basement one lazy summer night. I very quickly found myself revelling in the freedom of orchestrating multi-layered pieces without the logistical and emotional challenges of delegating musical parts to other players. Looping can feel very safe, because it is a compositional process often carried out in isolation and without the pressure or judgement of other players. For this reason, I think it can be a really liberating technology. What inspires your musical process: nature, observation, personal experiences? Music as a process has often seemed to be a spontaneous brimming-over of something that exceeds me, but which has somehow been metabolised through me. I think a lot of artists experience this feeling of being a vessel which creative expression moves through. So it’s hard to pinpoint where or how or what inspires a song or a piece of visual art or a dance piece. And so too can it feel difficult to take responsibility for something that doesn’t seem to be your own. I would say that the musical process, for me anyway, emerges quite spontaneously as an emotive synthesis of those things which move or stir me, which can be anything – a bird song, a newspaper clip, a shadow on the floor, politics, anatomy. Do you have any musical collaborations coming up that you’re looking forward to? Collaborations galore! I recently finished producing, writing, recording and mixing a full length album alongside Cayne McKenzie (of We Are The City) for spoken word artist Shane Koyczan. There is no release date to share yet, but I’m tremendously excited to share that project when the time comes. Also, I have started working more and more closely with LA-based producer and musician Ajay Bhattacharyya (aka STINT) on material for a new album and a series of singles, as well as developing a meatier live show. I couldn’t be more thrilled with the direction we are taking. Unfair question, and impossible to answer! Festivals are terrific if you let your guard down and participate in them, which I find many artists are not so inclined to do. The intimacy of small shows is often where the magic is, because there is a real opportunity to connect with people. It all really depends on the combined energy that everyone brings to a space, so small shows and festivals alike can be the best or the worst. You seem to have a pretty active touring schedule, does is it ever get tiring being on the road so much? Having just returned from two months on the road, I can certainly say that touring life can become treacherously draining. I take great joy in mundane rituals, because they are often the only thing stable enough in my world to ground me. Waking up in my own bed, whisking matcha in my favourite ceramic cup in a morning glow specific to my studio, watering my plants, holding my friends hands on long walks and gossiping about whatever … these are all things I miss sorely on tour. But touring is wonderful, whimsical, enriching and so inspiring, so I come to miss the touring life too after a while. That seems to be a concise analogy for the ebbs and flows of life in general, I suppose. What do you love most about the west coast? Water! The tap water is absolutely extraordinary here, and the ocean is so unbelievable. Water is a truly mystical substance, and we are very lucky to have so much of it where we live.